The GUI in Live mode is divided in several sections. The upper left corner is mostly unoccupied. You will only see a menu if you hold a party or go on a date. The menu shows a main goal and some tasks which you can try to achieve optionally. For each fulfilled task you’ll get points and after time runs out you get a medal. If you achieved gold you also get an object. 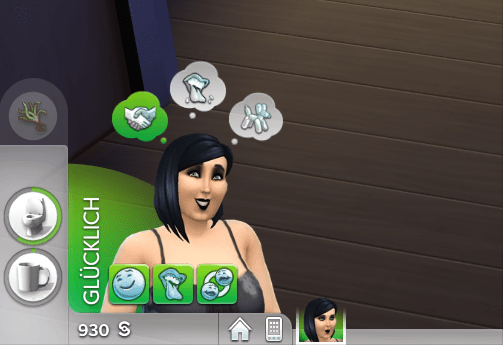 Here you can see the emotion your Sim currently has. 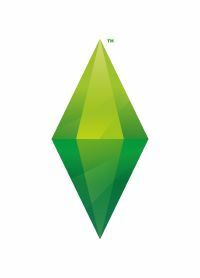 It is indicated by the Sims picture, the color and a text. You can also see the moodlets that lead to the emotion. 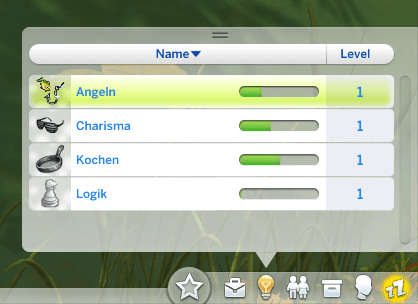 If you hover over the moodlets (which become a bar if there are too many to fit) you can see some info like an explanation and how much longer they will last. 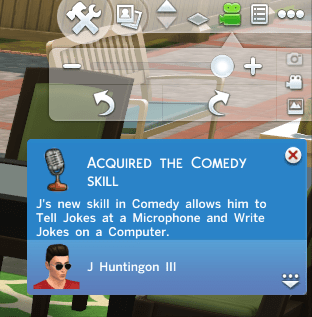 Not-sleeping Sims also have a sort of wishes which are now called whims. Those whims can depend on your current emotion (they will then be in the color of your emotion) or on your traits or other influences. For fulfilling you’ll get points which you then can spend on potions and other stuff. Actions without a length can’t be set to one (you can’t for example fish until you caught 5 fish or until your skill levels up, etc). 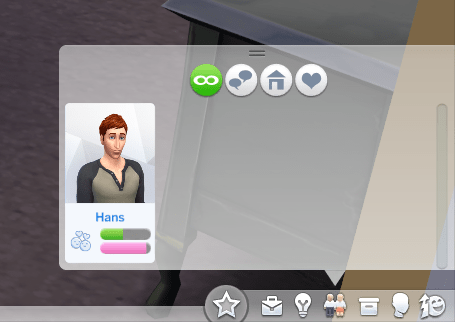 All you can do is actively cancel the interaction if you want your Sim to start the next one. There are influences that make your Sim stop doing stuff though but I didn’t have the time to find out what those are in detail. The little house icon doesn’t make the Sim go home as one would think but it centers the camera on your home lot. The phone has numerous other interactions most of which are known from Sims 3. You can silence the phone, browse the web, play a game, plan a social event, move the whole household, hire a service, find or quit a job or you can go traveling alone or with another household member. EDIT: If you know any Sims, you’ll also have a chat and send text option. You also find the rest of the household members here as well as the information how much money the household has. 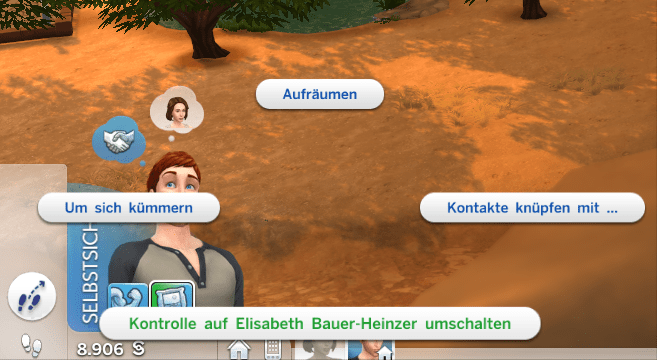 Like in Sims 3 you can change the active Sim by clicking on the icons. 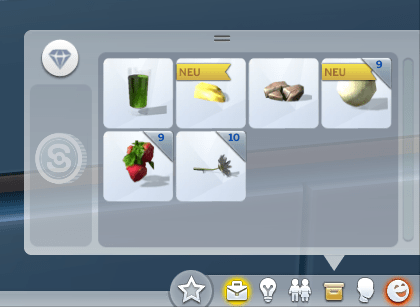 Depending on where your Sim is, you get some more icons on the Sim itself on which you can click. 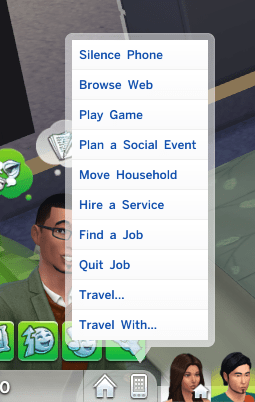 If your Sim is not at home, you’ll get a house icon on which you can click to send him home. 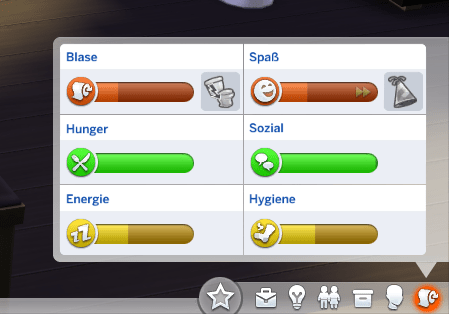 If a Sim is grayed out because the active Sim is on another lot or another world, you’ll also get an icon with interactions you can give the inactive Sim. They can autonomously clean up, care for themselves or socially interact with another Sim of your choice. You can also switch to the grayed out Sim. The controls for the speed can be found in the lower middle part. You can also see the current time and week day. I forgot to check if you also see how long you have played. The menu bar in the lower right corner has all kinds of icons. The menu bar itself also gives you info if you have all menus closed. The needs menu always shows an icon for the need that most urgently needs your attention. It’s also highlighted in the appropriate color. 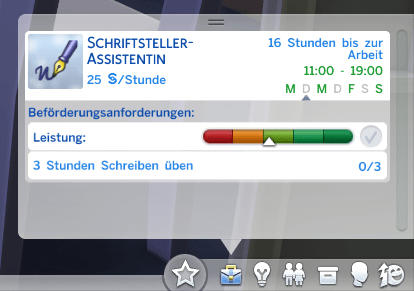 The career icon is highlighted in yellow if your Sim is supposed to be at work. F.l.t.r: Aspiration and minor goals, career, skills, relationships, inventory, Simology (Statistics, traits and age group), needs. Relationships now have two bars. One for romance and one for friends. You can also filter by friends, Sims in your household and Sims you have a romantic involvement with. There’s no family tree. You can still stack similar items in the inventory and sell them together or you can sell them individually if you want. The icon with the diamond opens the collection journal. For each need you can click on the icon and an interaction that will fulfill the need will be added to the queue. 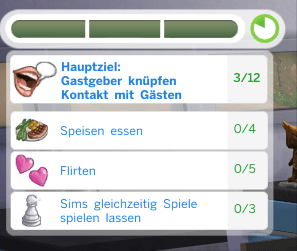 Depending on how low the need is, the game chooses a different interaction (nap if your Sim is a little tired, sleeping if he’s really tired). Changing between Build/Buy Mode and Live Mode, the gallery, change the level, walls up, down, half, video and photo menu, notifications and options. The notifications you get during the game are also here. By clicking on the little picture icon on the video/photo menu opens a window with the Sims memories and all screen shots you took by pressing c.
The conversation menu can be found in the upper middle. By means of a little colored bar underneath the menu you can see what emotion your opposite has. If there are more than one Sim in the conversation (you can recognized them by the transparent plumbob over their heads), you’ll get little arrows with which you can switch between them. Interactions which can be engaged because of your current emotions have a colored bar next to them and the breakdown in categories is not only accessible through the MORE button (unless you change that in the options). The first level of the menu now contains suggestions of interactions that are appropriate for the current situation. The GUI of the Buy/Build mode looks a bit different but I didn’t really look at that. The most important parts are shown in the screen shot below.